In a time when the League of Legends meta game looks like a mess, when all regions use korean exports and the Korean playoff system only makes it possible to watch a few best of series, I like to dwell on memories of a better time, a time where new blood rose and old soldiers fell in the korean League of LegendsIt was no longer mainly about the CJ teams and their star players like Flame, Shy or Madlife, instead, new stars like Faker, Piglet, DanDy or KaKAO made themselves known with huge individual plays and influenced the meta of their roles tremendously. This was a season marked by a huge number of individual plays. Some of the most memorable plays in LoL history were made in this season. CJ Blaze top laner Flame was a monster with his Kennen Flash Ultimates, which won many games for his team. CJ Frosts support Madlife made a name for himself as a god again, by having multiple huge Thresh hooks in which he predicted the movement of his opponents, to degrees we had not seen before. Everybody knows about Cpt Jacks legendary Cleanse/Vayne game where he carried his team from an almost completely destroyed base. A certain MVP Jungler named DanDy showed insane Lee Sin games in which he won multiple by himself, by taking over the game or stealing crucial objectives. Speaking of objectives, sneaky Barons were a common thing for the KT Bullets and of course afficionados of the Korean League remember the great plays by SKT Faker, who ended the season with the legendary Zed vs Zed outplay, still the most memorable and mindblowing LoL outplay ever. The Storyline of the playoffs was exciting to watch: two teams with diametrically opposed strengths ended up meeting in the final and a rivalry of two organizations people already know out of Starcraft culminated. On one side of the bracket the KT Bullets, a team less about star players and more about a smart strategy. On the other side the young team SKT in their 2nd split, beating the previous Champion MVP Ozone. Both finalists were clearly far ahead of everyone in Korea and in my opinion the two best teams in the world at the time. The first time no team from the CJ or Azubu organisation made it to the final, the top 3 consisted of SKT, KT and MVP (later Samsung), who all went on dominating the future of OGN in the coming seasons. The teams who now were on top of the standings, had role players in the top lane and and their star players were either Mid or ADC stars (like Faker, Dade, Imp, Piglet) or a smart strategic approach to the game. Veterans of the jungle like Cloudtemplar or Helios couldn’t match against the likes of KaKAO or Dandy, who were also arguably more vibrant and exciting to watch. With these teams Korea manifested itself as the strongest LoL region by far. From now on, Koreans would dominate the scene until this very day. The season was started by none other than the champions of last season, MVP Ozone. They fielded the same roster. They were placed in the arguably weakest group (in terms of top teams) of the tournament, with both Xenics teams and Jin Air Green Wings Falcons. They started against Xenics Blast, which consisted of either rookies or unknown players. The only two players who would make an impact later on in the Korean league are support Boink, now known as Chei, the current support of Jin Air Green Wings, and ADC Bang, now reinging World Champion ADC of SKT T1. As expected, the match of both teams ended up being two more or less one sided games for MVP Ozone. Driving force behind these victories was Ozone’s jungler DanDy, who brutalized the Blast team and especially in the 2nd game just simply destroyed his opponents as Lee Sin, running around the map, killing everyone and deciding the game with an epic 5 man Lee Sin kick. Nevertheless, Ozones matchup against Xenics Storm looked pretty different, with Storm putting up a good fight vs the defending champions and which made for a close game 1. Ozone was victorious, Storm proceeded to win game 2 convincingly. To make a statement and show their strength, Ozone went on to 2:0 the Jin Air Facons, a Team that consisted out of no names, who were getting carried by former star top laner Reapered, now the jungler of the team. Particularly the 2nd game was such a dominant performance by Ozone, mainly (again) by Dandy, being part of almost every single kill in the game, counter jungling the living crap out of Reapered. Even mediocre top laner Homme went on solo killing JA’s top, Miso (now known as North Americans Team Liquid Mid laner, Fenix). Both Xenics teams would go 1:1 against each other but both also lost 2:0 against Jin Air, which lead to Ozone making it out of the group in 1st place with a score of 5:1, and Jin Air following in 2nd place with a 4:2. Anyway, this wasn’t a sign of Jin Air being a strong team. In fact, the team was pretty weak since Reapered wasn’t a great jungler at all, and his teammates were mediocre at best at every position. Group B consisted of Spring Finalist CJ Blaze, Winter Champion Najin Black Sword, Chunnam Techno University (CTU) and Jin Air Stealths. Sword, who just lost their prodigy top laner Maknoon and replaced him by Najin White Shields hyped up top laner Expession, they went on to their first matchup against CTU, a team with no reputable players names and to this date only support player Wolf is a known player and went 1:1. Same result. We expected the same outcome against the other two teams, but it ended up being a pretty bad result for Najin Sword since it wasn’t enough to make it out of the group. Surprisingly, the underdog CTU had to play tiebreaker with CJ Blaze to determine the groups 1st and 2nd seed, which CJ Blaze won. But it’s important to note, this roster of CJ Blaze wasn’t in the same form as they were before. This was no longer the team who won 13 straight games in a row, this was a team that had a lot of problems, starting in the bot lane, with Cpt Jack and Lustboy not having a lot of synergy and former star mid-laner Ambition seemed to be in a slump since he got crushed by Ozones mid-laner Dade 3 games in a row in the Spring Finals. For their upcoming playoff match, Blaze decided to field their substitution support player Muse, in hope of their bot lane performing better. The Situation for Najin Black Sword however was even worse: From being arguably the best team in the world a half year ago, the team didn’t even make it out of a group that was considered weak at the time. The team still had a lot of Circuit Points as well as the win in NLB later in the month, but but based on the opinion of experts, the team was evaluated to be the 6th best team in the region at best, while having a guaranteed World Championship spot. Group C looked pretty interesting, with SK Telecom T1, Najin White Shield, MVP Blue and Incredible Miracle #2. Shield had just changed parts of their roster, releasing support player Wolf and replacing him with rookie Gorilla, Mid laner Save moved to top lane and former Starcraft Player Ggoong filled the vacuum that had now existed in the mid lane. Locodoco was still the ADC and NoFe the jungler. SKT, who’ve been given the nickname Judgment Day by the Casters Doa and Montecristo, placed 3rd in the previous season, beating out the former roster of Shield in the quarters for a quick 3:0. This split they continued their undefeated streak against Shield, going 6:0 in the group in dominant fashion with not losing a single. In the previous season this team was made of out of older players like Mandu and also high ranked soloq superstars like Faker and Piglet. The also known as called “Faker and company” team adjusted more and more to the competitive league and improved their strategic play and teamwork with every new opponent. Regarding the other teams, MVP Blue already had 4 of the players who went on being the next years spring split champions (3 of them with a different alias), however in this season they failed to make an impact. The new roster of Najin White Shield made it out as the 2nd place. The teams in the last Group were KT Bullets, MiG Blitz, Incredible Miracle #1 and CJ Frost. CJ Frost were a veteran of the scene, so far they made it to 3 OGN Finals and one Semifinal, winning last years summer Season, 2nd place at the S2 Worlds final and multiple IEM appearances. Sadly for frost, those glorious days would stay in the past, as the team, like their sister team, had multiple problems. Their new ADC Space and new AP Carry Ganked by Mom weren’t as good as the other top players in their position at all, and jungler CloudTemplars spring split was the worst split of his career so far. The main carries of Frost were still Shy and Madlife. Madlife remained the most feared Thresh player in the league. With the rise of Mata during the previous season, Madlife finally found a support who came close to his level and and who was able to rival him in terms of the title as the best support player in korea. However during Summer Madlife was still the more impactful player, as he played with way less skilled teammates than Mata did and managed to perform better despite that burden. After winning their first match up convincingly, Frost went 1:1 with the Bullets, who just moved their jungler inSec into the top lane and had their former jungler KaKAO return from the Arrows. The Bullets, during the Group Stage suffered from the lack of experience of their new top laner. inSecs move to the top lane as he was concidered to be a world class jungler is still questioned today. You have to ask, what was his function? In the top lane he was mostly a role player for his team, still acting as the engage tool of the team, while now getting solo lane farm and experience to be a lot more stronger in teamfights. The freakiest thing about inSec was he had some kind of a global taunt at him since every time he was wandering alone over the map, he got caught by the opposing team but barely escape mutliple times with the mobility of his weird champion pool, which consisted out of Zac (his most played champion in top lane), Shen or Lee Sin. In the past the KT Bullets were a team with strong strategic approach, being able to outrotate their opposition, taking objectives and adapt to the opponents moves. During the summer season they didn’t lose this ability and also showed stronger individual performances. IM and MiG were two teams with mostly unknown players, but today most of us know the names from some of them, namely Reignover, Pawn and Smeb! To avoid a possible “teamkill” with their sister team, Frost went on 2:0’ing MiG, marked by the great Thresh play of Madlife. Frost went 5:1 in the group as 1st seed, followed by the KT Bullets who went 4:2. This meant KTB would be the first team to play in the quarters, against CJ Blaze. The matchup in the past was always pretty one-sided for KT. The Bullets until that point won their last 7 games against Blaze. This was in a time when Flame was still new to the team and wasn’t really integrated into the team. Now time had passed and Flame was arguably the best top laner in the world. The CJB/KTB Matchup turned out to be a close and really exciting series. The obvious weak point of the Bullets compared to Blaze was inSec, being new in the top lane, he suffered the slight inconvenience of being matched up against the best top laner in the world. KaKAO pressured Flame every game and gave either inSec or himself First Blood in 4 out of the 5 games, but this couldnt’t stop Flame from performing by far the best out of his team. Game 2, the only time KaKAO didn’t ganked top in the first 5 minutes, ended up Flame destroying inSec in lane and carrying the entire game because his Vlad was way too huge to handle. Game 3 is a classic high level OGN game due it being extremely close and exciting the entire time. It’s the legendary Cpt. Jack Vayne game in which he displayed multiple times perfect cleanse mechanics and great kiting to carry CJ Blaze to a win despite losing their nexus turrets. Game 4 however was one of the first games in which KaKAO went mental and showed why he was a considered jungle superstar: In danger of being eliminated he played a fantastic Elise game, creating kills and objectives on the entire map and won his team the game. At the end of the game he was part of every single kill the KT Bullets had. Sadly for CJ Blaze it went to the 5th Blind Pick game, in which Blaze never really looked comfortable. The Bullets picked up the infamous Twitch/Shen submarine comb and killed Cpt Jacks Ashe multiple times with the sneaky Shen ult/stealth mechanic. Ryu played Zed, the bane of Blaze, and ended up crushing CJ Blaze with it, just like Dade did in the previous Finals. The series ended up being a 3:2 win for the Bullets. Even to this day I really enjoy watching this series because it’s so exciting and filled with great plays, memorable moments, strategy, diverse champion picks and comebacks. Sadly for the viewer, the rest of the quarterfinals ended up being not even close as being as exciting as this series. CJ Frost 3:0’d the new roster of Najin Shield, SKT T1 3:0’d their former sister team partners and MVP Ozone 3:0’d CTU to move on to the RO4. The first matchup of the Semifinals was the KT Bullets against CJ Frost, who wanted to take revenge for their sister team Blaze. However, even this series ended up being a one sided affair, 3:0 for the Bullets. They targeted Madlife’s champion pool every single game, which made it hard for him to have an impact on the game, so he defaulted back to Lulu and Sona. inSec picked his best champion, Zac, every single game, on which he had already tremendous success against CJs other top laner, Flame. Shy decided to go with Shen every game, but he he didn’t even came close to the level of impact inSec could get in a teamfight. CloudTemplar saw himself heavily outclassed by new generation jungler KaKAO, who made big plays with champs like Elise or Lee Sin for his team. Since Frost played in a similar style like they did in the past and hadn’t really changed their team’s identity, it was easy for the KT Bullets to figure out the strengths of their opponents and counter them efficiently. KT Bullets denied both CJ teams the entrance into the final and gave us the first finals without a CJ Team ever. On the other side of the bracket, SKT was matched up against MVP Ozone, which should end up being a long time rivalry. The last time both teams met, in Spring Semis, MVP Ozone won. The first game, again, was a convincing win for Ozone. For the next games, Judgment Day changed up their style and stopped running scaling teamfight-comps and instead used early game pick champions, such as Ahri, Shen and Vi. After a rough start in game 2 SKT ended up tieing up the series. While Ozones top laner Homme and mid laner dade got outshined by their opponents, Faker and Impact, the most exciting matchup in this series was Piglet vs Imp, who both played a similar style and always ended up in a Vayne/Caitlyn matchup. The next two games after being close in the first 20 minutes again, turned out in SKTs favor. They had defeated the previous champions. The emotions were huge, Piglet was crying after the 4th game and every SKT player was just euphoric. Before the Final could be played, the 4th place game took place, featuring MVP Ozone and CJ Frost. This match was really important for Ozone. For Ozone, this match meant that if they won this series against Frost, and SKT T1 win in the finals against KT, MVP Ozone would go automatically to worlds due to Circuit Points advantages. The outcome of this match didn’t really matter that much for Frost, since they had to play in the Regional Qualifier regardless, it would just give them them a higher place in the gauntlet. Frost used their new Mid Laner, Ganked by Mom in all of these games. It was a close and back and forth series, but not a really clean series since both teams made a lot of mistakes. Ozone really put a high priority into either first picking Thresh or banning it away from Madlife, so they reduced the star support of Frost onto Lulu and Sona picks, which made it harder for him to carry. Still, both Madlife and Mata made great catches and impacts for their team and created kills and objectives all over the map. Jungle relic CloudTemplar wasn’t as impactful on champions like Elise as DanDy was and his to go junglers Amumu and Maokai sadly weren’t strong enough in the meta, yet he still picked them. As the series reached the Blind Pick Game 5, it’s important to remember, until this point in time Frost were the kings of blind pick, since they’ve won multiple crucial series (like vs. Blaze or CLG.EU) through blind pick. This was Frosts game to lose. They had a 7k gold lead when they took a favorable team fight, which they won. They decided to go for a Baron. What happened now is a moment of history. Ganked by mom failed his Zed Shadow over the wall which lead to him having to go around the pit to damage the Baron. DanDy, after being revived again, went straight to the baron. If Ganked by Mom had gone over the wall, Frost would’ve killed the baron 100% before DanDy even got there. But this gave DanDy just enough time to dash over the wall and steal the Baron. Right after this, Ozone took a teamfight in the front of Frosts base, even though they were in a gold disadvantage but through the baron buff they had enough power to win the fight and close the game to their side. Ozone was relieved since this meant they probably didn’t have to play in the qualifier gaunlet. They secured the 3rd place of the season. DanDy, again, carried his team. For the finals the two strongest teams in the world were matched against each other. On the one side the KT Bullets, who’ve taken down the sister team which were the previous kings of korea, on the other side SK Telecom, who just eleminated the previous champion. It wasn’t uncommon for the two organizations, KT Rolster and SK Telecom, to meet each other in a final, since there is already history due to Starcraft Brood War. Both Kespa Orgs met each other multiple times in Proleague, which is why this is called the Telecom War. The hype for the final was big, the matchup couldn’t be more exciting! While SK Telecom consisted out of strong players from the high solo queue ladder, such as Piglet and Faker, the KT Bullets still had strong players but no real superstar, they relied more on their teamwork, ability to adapt, rotation game, strategy and objective control. The final would take place at the end of August. If SKT wins, they get the last spot in the gauntlet to qualify for worlds and it would also ensure an automaic qualification for MVP Ozone. However, if KT Bullets won their trip to worlds would have been guaranteed, while most likely Ozone and SKT had to fight about the 3rd spot against each other. Due to points earned in previous seasons and NLB, Najin Black Sword was the first place team to go to the Season 3 World Championship, even though they didn’t get out of groups in the summer season. The Stage of the final was a big field to the feets of the Olympic Subsidiary Stadium, with thousands of viewers. It was a rainy day, but this couldn’t stop the hype of the match and the excitement of the viewers. The Opening was performed by the song “We are the champions” by the group YellOW as the players walked into the stadium and got ready for their match. For game 1, the KT Bullets went for one of their fast push comps, with Ezreal/Fiddlesticks bot lane, which they loved to run in the past. SKT, like in their first game against Ozone, went more for a teamfight approach with Kennen/Orianna/Sona, but since KT never really wanted to fight their opponents. they just ran all over the map and pushed SKTs base down really quickly. Score played the game of his life on Ezrael, sniping a lot of kills all over the map with Trueshot Barrage. The unsung hero of SKT in this game however was Piglet, who still played incredibly well despite his team losing. Game 2 ended up looking similiar, with KT Bullets going again for a fast push comp, this time for Tristana/Fiddlesticks, for which Score rushed a Statikk Shiv on his Tristana to push down waves and towers even faster, which ended up exposing the Nexus of Judgment Day in pretty fast manner. KT realized after game 1, Piglet is a dangerous factor, so they focused him pretty hard and denied him a lot farm and didn’t give him a single kill in the game. Again the style of SKT with champions like Jarvan, Nasus or Sona couldn’t really make a impact against the Bullets. Being two games down, SKT changed up their play-style with game 3. Instead of banning the Zed, which Ryu looked dangerous on Zed every game in the summer, SKT picked it first and went for a pick comp style with Zed, Vi and Malphite, while banning out Mafas Fiddlesticks, who made a big impact in the first two games. Faker started to solokill Ryu multiple times in lane. Remember, back then it was way easier for a payer alone to carry games, which led to Faker getting huge pressure on the map. SKT outclassed the lanes of KT Bullets and killed them straight when they tried to swap lanes and rotate over the map, which resulted to the Bullets not getting a single objective in the entire game, 4:24 and surrendering at 20 minutes. Game 4 was the closest game of the set. The style of picks was similar to the previous game. For the first twenty minutes however the game went pretty close, but it wouldn’t be for long, as SKT outclassed the Bullets in every single skirmish and rotation. As the game went on and the advantage got bigger and bigger for SKT. inSec on Zac got impatient with his engages and went in too early too many times which ended up him being killed and also certain members of KT dying as well, giving SKT more and more space and pressure to end the game again for their side. The infamous game 5 started, and both teams picked Shen for top lane and Zed for mid lane. Since this was Blind Pick, both teams could pick whatever they want. Sadly for the Bullets, again the solo lanes of SKT were too much to handel for KTs side. Even after a lucky level 1 fight for KT, which gave Ryu the first blood gold of 400 gold in a mirror matchup, it wasn’t enough to beat the god mid laner which was Faker. Filled with skirmishes and fights the entire game, SKT gained advantaged over advantage. After a lot of bloodbaths: again, a moment which made history approached. 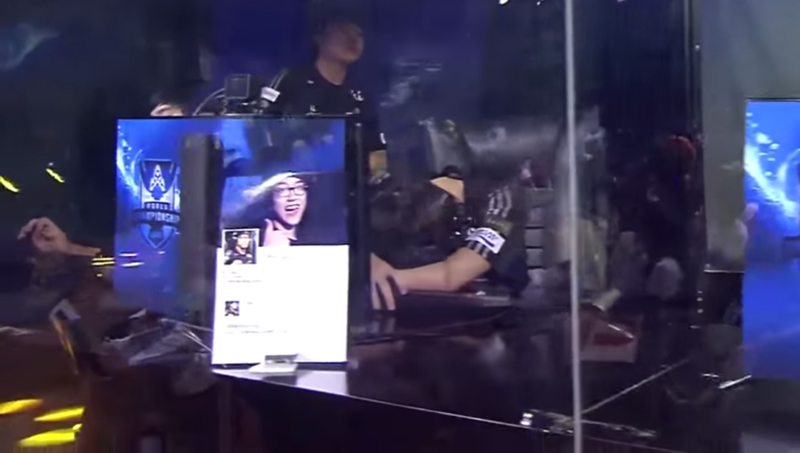 To change course of the series, Ryu went for a 1v1 with Faker as he pushed down the mid inhibitor tower of KTs base. Both Players used the Death Mark Ability, after a short intense fight it was Faker who did incredible mechanical things aka #thingsfakerdoes and survived with 100 health. Even to this day people talk about this as the most epic moment of League history. It wasn’t a play which decided the already one-sided game, but it was a great finish to an epic season. After 37 minutes SKT won their 3rd game, after being 2 down at first and reverse swept the KT Bullets. Faker won the MVP award of the season, which is totally justified, however I also wanna highlight Piglet, who played one of the best ADC performances ever in a series. Even tho, KT won the first game and Score was fed massively fed, Piglet still ended the game with a 9:2 scoreline and did everything he could, dodging every gank possible and doing as humanly possible he could. Overall, SKT deserved the win, since they figured out the strategy of their opponents and outclassed them mechanically. 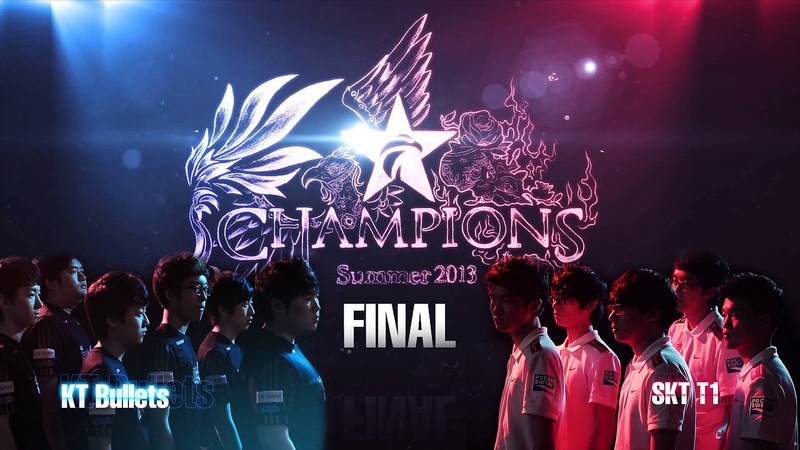 SKT were the OGN Summer Champions and went on being the final boss in the regionals. By a lot of experts this Final is considered to be the best LoL series ever. The KT Bullets, who were so famous for their diverse strategies, tunneled too hard on their fast push composition and waited until the blind pick game to change up their picks, but they got individually outclassed in the blind pick game. Now they had to run the entire Regionals, if they wanted a trip to Worlds. 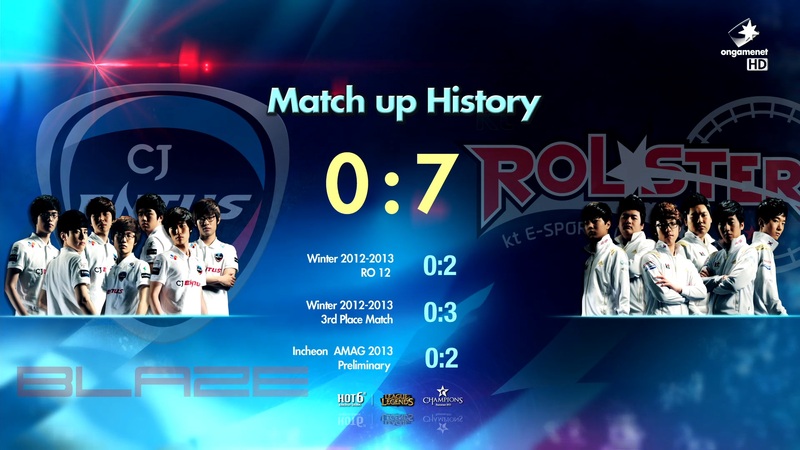 Not even a week later the KT Bullets had to play two best of fives against both CJ teams and SKT again. The patch however was a pretty big change: it was the patch which Trinity Force got a massive buff, which made champions like Corki and Ezreal more popular. Sadly for someone like me, who really loved the CJB/KTB Quarterfinals series, the next series of Bullets vs Blaze turned out to be really one-sided. Blazes only shining light again was Flame, who again beat inSec in every single game in lane, but it wasn’t enough since the rest of Flames team was dying. Blaze still didn’t fix any issues they had in the previous match against the Bullets or in NLB, when they lost 2:0 against Najin Black Sword, who weren’t considered to be a really good team. Blaze still suffered from the same issues, in fact even worse in this series: Cpt Jack got switched out for ADC Hermes, who lost lane every game against Score and performed even worse than Cpt Jack ever did. Ambition had his worst performance of the entire year; he was just playing Gragas and Karthus, farmed the entire time and died multiple times either 1v1 or in dumb in the jungle. Lustboy had a terrible vision game and got caught out repeatedly. KT however looked like they recovered well from the loss against SKT. Score especially performed great on Triforce Champions like Ezreal and Corki. And the Bullets faced CJ Frost, and again they won 3:0 as well. Just like Blaze, Frost didn’t bother at all in changing up anything in their strategy, except different top lane picks rather then just Shen. But Shy didn’t have a god series: neither his Jax nor his Singed, two champions he used to be really well known for, changed anything in the game. Just like in the previous series, Ganked by Mom and Cloudtemplar looked just bad, Madlife (who was once again targeted by all bans) again targed of all bans wasn’t able to make an impact without a carry. Meanwhile Ryu was a huge carry for KT as he played multiple great games on Gragas, Ahri and Fizz to win the game for his team. For the regional final we had the same matchup as for the summer finals, KT Bullets vs SKT, just a week after the finals. And again, KT won the first game in dominant fashion. KT again used the strong Corki pick, also Ryu played a great game on Fizz. But just like it happened in the summer finals, SKT came up huge and won the next 3 straight games. This time it wasn’t an adapting to the strategy of the Bullets, since most picks were pretty similar over the whole series. It was just SKT playing on an even more high level than they did in the finals. The team was still in growth, but with their win in the finals they made a huge step. Again they outclassed the Bullets in most positions and were able to get victory over victory over them, more convincing with every game. Game 4 was a surrender of the Bullets. Their Worlds dream was over. 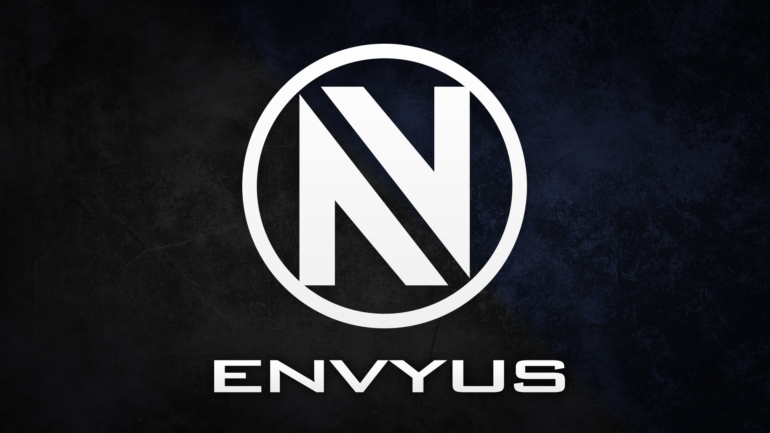 Arguably the 2nd best team in the world, was tragically not able to attend Worlds. For SKT however this was just the beginning. In the next few months they would go on to win the S3 World Championship and then going undefeated in OGN Winter season. During this time SKT was probably the strongest a LoL team has ever been. In the end, this may have not been the most competitive season of the Korean (the most competitive one would be Spring 2014), but for me it is the most meaningful historically. The younger talent was on top and got the older teams like CJ or Najin to make necessary changes. And not only Korea, the entire world looked at the nation that just won worlds to improve their own game-play. With OGN Summer 2013 we say goodbye to old occurences and players, like CloudTemplar, and see the rise of new talent emerging in the scene. For me this season still has to be the pinnacle of League of Legends history, whose matches I still watch today. Two of my favorite Best of 5s ever, CJB/KTB and KTB/SKT, took place during this time, making the choice, combined with the epic storyline, even easier. If some of you, like me, like to talk about “good old days in league”, this season has to be mentioned. At the end, I just want to link a video made by the official OGN Youtube Channel, which sums up up the highlights and emotions of this season perfectly.